I’ve read a plethora of books on the subject of caregiving and aging in the first three years of my life with Mama. Here is my list in no particular order. Well, I guess they are in the order I read them. Favorites are ★. 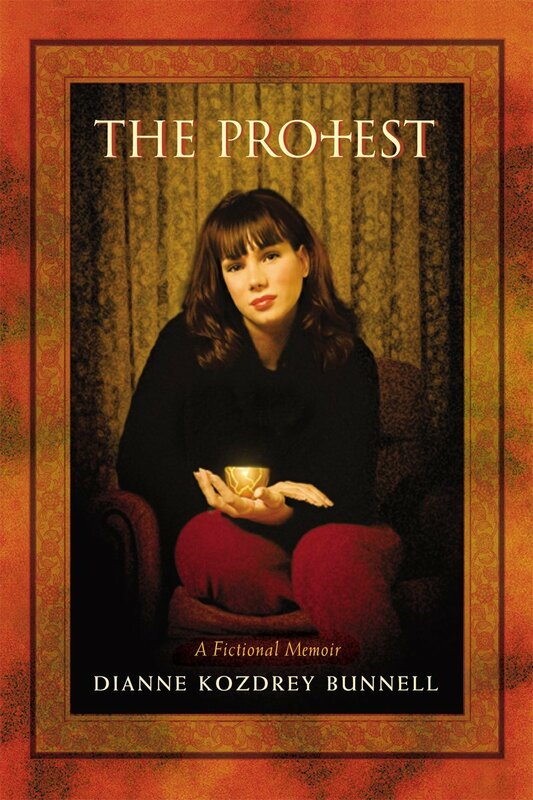 The Protest, by Dianne Kozdrey Bunnell. Dianne Kozdrey Bunnell is my writing partner and good friend. But that is not the reason I am telling you to read her book, released today for Kindle on Amazon (also available in hardback on Amazon). The Protest is a damn good read. And it’s available today only (March 19) for the ridiculously low price of $2.99. It is worth every penny of that price, or the regular price of $4.99 after today. This fictional memoir is a riveting tale superbly told about the lengths to which a mother’s love can go, as Janey strives to save her daughters from their father. I was alternately laughing and horrified as I read into the night, unable to put it down. It is a terrifyingly credible novel of what can happen when religion is used for personal power, and the manipulation of the lives of innocent children hangs in the balance. I highly recommend this book to anyone who loves beautiful language, compelling characters, and a gripping read. This book is a big eye-opener about how Medicare, the pharmaceutical industry, doctors and hospitals work when it comes to caring for the elderly. It is a story about how the medical profession refuses to consider the toll on the family or their wishes. It is a tale about the critical importance of how we as a nation fail our elderly and must work our way back to the sacred way of death that our ancestors knew before we got so smart. It is a book that should be read by everyone who has or will have an elderly partner or parent. This novel is based on the real life story of my friend and sister writer, a member of my writing group. Jane, the novel’s protagonist, loses her young adolescent twin daughters to brainwashing by their charismatic and twisted father, the Rev. Logan Churlick, and his fanatical religion. After battling through the courts to save them, Jane makes a Solomon decision that expresses mother-love beyond the bounds most of us will ever know. It’s been a long time since I read a book I couldn’t put down. An extraordinarily written story of three generations of women experimentally living together. Katie, a young widow with a teenage daughter, brings her mother to live with them. The many unresolved emotional crises of Katie’s childhood and the turbulent relationship with her mother then and now are a recipe for disaster. Some would say the experiment failed, as they could not continue to live under the same roof—as they did not in Katie’s childhood. But ultimately it becomes a courageous healing journey for all three women; and it is a riveting read. I haven’t seen the NetFlix series yet, but I understand it’s dramaed up. Piper Kerman’s memoir about her year spent in a federal women’s prison for a 10-year-old crime is a beautifully told story of women looking out for one another with compassion, humor, creativity, and respect; helping each other do their time and survive. And they do it under the auspices of a system designed to do just the opposite. Kerman grows incredible friendships with women she would not have dreamed of associating with on the outside. They become family to her. I will watch the fictionalized version, but I’m glad I know the real story. I tried reading this some time ago, but the three unread novels on the chair called to me louder and it went back to the library unread. But I just finished the audio version, read by the author, and I loved it! Especially the first half or so (I got a little bogged down toward the end). It’s about a woman’s life, from childhood memories to manic motherhood to middle age, using the events of her life to illuminate ours. It’s funny and poignant and thought-provoking. I found myself in it, as I leave so much of life behind, and look ahead. And it’s short: you can listen to it driving around town. “The central question in the kitchen would have to change from ‘What do I want?’ to ‘What is available? '” This line might be the one that leads me to my next big adventure. It certainly has ideas tumbling through me like a volcanic eruption. The memoir tells the tale of a city girl turned farmer. And it is the story of the beginnings of “the most interesting farm in the country”; one that grows everything needed to feed a community. It isn’t just about farming or eating or local, organic food for me though; it is about turning a dream—and a heck of lot of hard work—into a life. It is about reinventing yourself, and finding sheer joy and fulfillment in it. A memoir of a not-quite-50-year-old woman who moves from New York City to “Greensbor(ing),” NC, moving her hoarder mother from Richmond to live with her near her born-again older brother and his new southern-sweetness wife. She and her mother never had a relationship, Jo having abandoned Mama Jo as a child when she moved with her brother and father to Florida. Everything about her course adjustment stretched her far beyond her comfort zone. What makes this book different from the many memoirs I have read on daughters caring for mothers is the author’s movement from non-relationship, to her mother becoming the love of her life. She discovered someone she never knew—a strong, funny, smart woman—because she opened herself to discovery. Other accounts of caring for aging parents have focused on how hard it is, how self-sacrificing, the relief when it’s over. They look at how society is failing the elderly, the challenges of incarceration in a care facility, and how frightening it is to grow old with nothing to look forward to. Those books have made me feel good about the sacrifice I am making; I am in good company. This one made me squirm. My favorite author. I can’t put her books down once I start. Well, I wish I didn’t have to. “When does a moral choice become a moral imperative? And where does one draw the line between punishment and justice, forgiveness and mercy?” The horror story of my parents’ generation, arguably of any generation, weaves into the current day and braids with an ancient folk tale. An author video with Natalie Goldberg authors.simonandschuster.com/Natalie-Goldberg/40374846. A well-written story by a first-time author and mother of two young children of her journey of loss and rebirth following her husband’s death on September 11, 2001. She describes the years following that horrific day as “powerfully transformative.” She likens them to alchemy: “from them she emerged a new person—wiser, more independent, more sure of herself.” Another unwhitewashed story of how hard life can be, and that one can emerge changed, but whole again. An excellent memoir that I recommend to my friends who have a parent or loved one suffering from severe dementia. It is raw and funny and heartbreaking and honest and I couldn’t put it down. And it made me know, again, how lucky my family is. Thanks for the recommendation of the The Protest. Since it was available on Kindle and on sale, I bought it and loved it.